A side-impact test hits the vehicle broadside at 31 mph, and a roof-strength test checks the model's safety during rollovers. A head-restraint test is designed to check for the likelihood of head injuries for the driver and front passenger. 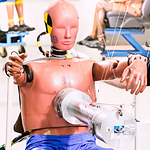 The IIHS also inspects and tests the safety restraints in the vehicle's back seats.